Better by Marand is one of the sponsors of Eurotransplant’s Jubilee Congress, which is dedicated to its 50th anniversary. The event is taking place from October 4-6, 2017, at Noordwijk in the Netherlands, under the main theme “Together on life-saving mission”. One of the topics discussed on the 5th of October will be the progress of renovation of Eurotransplant’s IT system CORE, which is underpinned by Better by Marand’s vendor neutral Better Platform™. Our is based on the postmodern open Electronic Health Record (EHR) approach, which enables hosting multiple applications and data registries on the same platform while benefiting from the separation of data from applications. Interoperability is the key within organisations such as Eurotransplant, which is collecting data from a number of hospitals across Europe while playing the key role in the allocation and distribution of donor organs for transplantation. 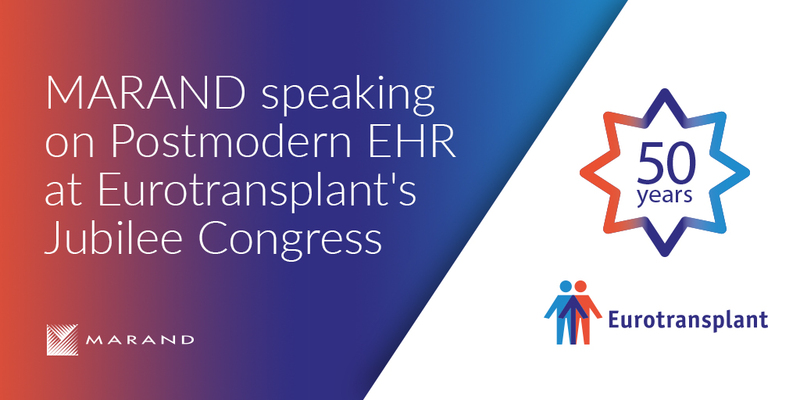 On the 5th of October, Miroslav Končar and Tina V. Vavpotič from Marand will speak about Postmodern EHR in the Parallel session I dedicated to the Eurotransplant CORE business (11.00 – 12.30). The Postmodern open EHR approach corresponds to Gartner’s recommendation, stating that truly effective and sustainable open arhitectures will need a capacity for vendor-neutral data persistence, such as utilizing a common scheme or set of archetypes and rules for managing structured and unstructured data. In their presentation, Better by Marand's representatives will also discuss the company's latest solution designed to support the treatment of chronic disease patients across the care continuum more safely. Pathfinder is an intuitive and effective disease management system powered by Better Platform™, which can be used as a primary tool for care teams or as an aggregator across different IT solutions adding missing functionalities. Pathfinder supports the patient care process from patient enrolment, assessment, examination and diagnosis to care plan setting and execution, and monitoring. Special modules, which can be added separately, also enable better communication within the care team , a comprehensive medication management (Think!Meds™ module), education content share, etc. The solution also enables engaging patients at home through multi-channel communication between the care team and patients, remote patient monitoring of vital signs, self-assessment through questioners, etc.